Lulu was a puppy who belonged to WinterGirl. 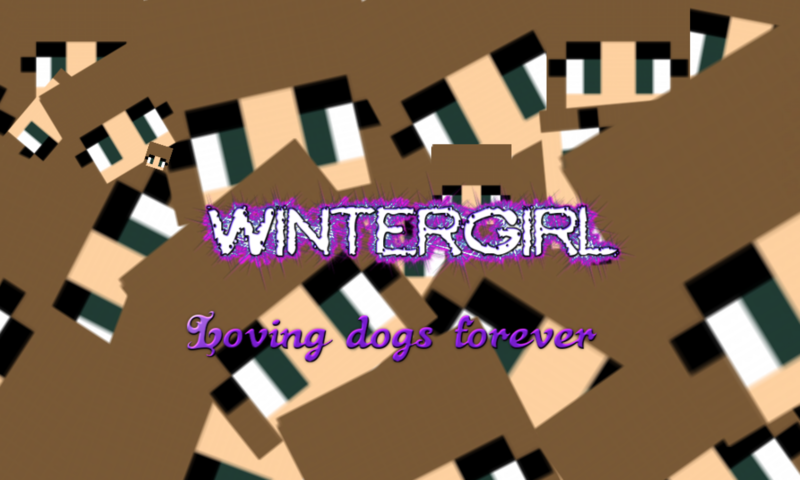 Both her and WinterGirl lived with EpicChasGamer also known as Chas. They lived in a mansion near Sir Wolf’s castle. This was the castle where the ruler of the kingdom lived with most of the wolves from the kingdom. The others lived in cottages nearby. These were the pregnant wolves. Lulu felt as if her whole life had changed when WinterGirl had tamed her as a puppy and she had felt wonderful. WinterGirl even took a picture of Lulu with EpicChasGamer. Lulu’s life always got better even when there were hard tasks to face. It was all ok as she lived with Chas and WinterGirl. Hope you enjoyed my story. Here are some pictures for the story. Lulu as an adult wolf. There were once two wolves called WinterWolf and EpicChasWolf. They lived together in the mansion that Chas and WinterGirl lived in which was the most wonderful mansion ever. The mansion was one of the most amazing place for a wolf to live in. There were bone blocks in each corner for the wolves to nibble at occasionally. One day the two wolves went out venturing. Suddenly they got lost and turned back but they could not find their way back. Eventually WinterWolf climbed a tree but fell down and got injured a lot so they carried on going. As luck would have it, they soon saw the castle. WinterWolf got so distracted she bumped into a tree. She had a regeneration potion so her heath was back to normal. It was quite tiring to get back but at least they were safe. I will be writing more! I play on this and it actually belongs to me. Hopefully we will get wolves too! Time to survive is a world on Minecraft that I made. It is a great world I even found 1 diamond! Sorry I have not posted recently. I have been busy playing Minecraft with Chas so I just haven’t had time. Most of the worlds have wolves in (I think probably all the worlds had wolves in!) but I didn’t post about the worlds because I didn’t take any screen shots or record anything I did on these worlds and I didn’t do anything interesting on them. Me and Chas are going to make a map in Minecraft. Hopefully we will put Wolves in it. Luckily I didn’t mine straight​ down!!! If you like Minecraft Wolves then you’ll love this adorable untamed wolf!